Realized it was a mistake coming back here within the first few days. Oh well, at least I found my Columbia River pocket knife that I had dropped while breaking camp last fall. Doing something two summers in a row definitely does not fit into my idea of a ‘bucket life’. At least I learned not to do it again. The first few weeks were pretty wet. 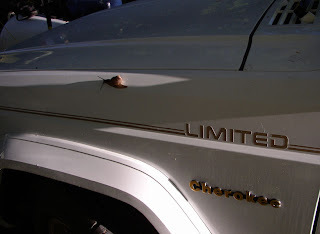 It’s not often one has snails crawling on one’s car. Occasionally after coming back from giving-thanks and having breakfast, I’ll sit outside with coffee and watch Meadow and Onyx exploring and playing. They are so entertaining. What a treat. The only drawback is getting splattered, from time to time, by the hummingbirds (still going through 25 pounds of sugar a month like last summer). We’ve been going out on some nice half-hour walks in the early evenings. 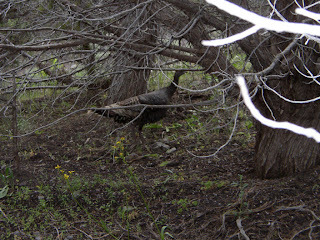 One evening, a wild turkey hen popped up out of the tall grass only 20 feet away. I saw some other movement in some open patches and she had eight little ones with her. By the time I got Meadow and Onyx back to the camper, grabbed a camera, and got back up there, I had trouble finding them. The family was a good 50 yards away over in the trees. Could not get a good shot with all the shadows. The little fuzz-balls blended in too well. The family was getting stressed with me around so I bagged out. No matter how often I tell myself to always keep a camera handy, it just does not sink in. Maybe I should get one of those small ones that can fit in a pocket. 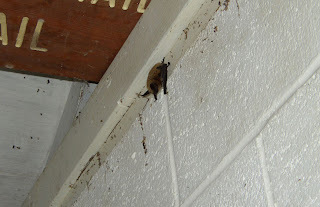 One day I went into the tool shed to get something and there was a bat taking a nap. Cool. I like bats. Another day Onyx came out of the grass with a snake in his mouth. Thankfully, it was not a rattler. There are way too many rattlers in this canyon. He had it by the middle and the head and tail were dragging on the ground. Have not been seeing as many fawns this summer as last. Spotted my first Bighorn up on the crest trail last week. Way cool. 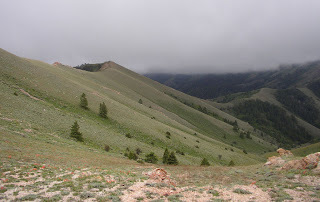 Wildlife Resources put 140 of them in the Stansbury Mountains. So far there have been three confirmed cougar killings. Something was getting into the trash trailer at night and shredding all the bags. Not a good thing. I was not sure if it was another raccoon or the 3 feral cats here. I asked the area manager for a Havahart trap. Baited it with a bowl of cat food and caught a really cute raccoon the first night. It was a small one so I was thinking there might be a whole family here. Continued to set the trap for a week and no other animal was caught nor were the bags touched. I forgot to take a photo of the raccoon. Guano. It was 5:00 in the morning and I had not yet had any coffee so I guess I was just not thinking yet. Took her down the road a couple miles and released her. 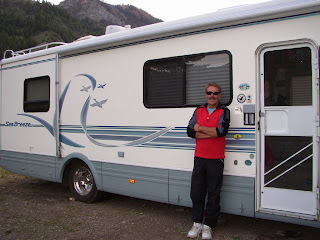 A class A motorhome stayed up in one of the disperse sites in the canyon for a few days. Michael is from Germany. He had a restaurant for 20 years in East Germany. Now he is semi retired and leads tour groups. This spring he had 20 Germans with him and they rented 8 class C motorhomes for a few weeks. His tours are pretty active since they do quite a bit of hiking along the way. Nice. He also leads tours back in Europe. Michael still lives in Germany but comes over to lead a tour each spring. A few years ago he purchased his class A here, keeps it at a friend’s house in Las Vegas, and comes over for a few weeks in the winter and travels around the states to the south. Not a bad life. He’s in his 60s and is in great shape. A strong hiker. Good in the outdoors, I barely heard his steps when we went for a short hike to a trail junction. He then went off on a bear of a 7-hour hike while I just did a short one so I could get to work. His pocket inverter died so I lent him mine. When he returned it, there was beer in the bag. What a treat. I asked him what it has been like over in Germany since the wall came down. He mentioned that one problem they did not have in East Germany while the wall was up was homeless people. Everyone had a house or at least a room to sleep in every night. Now there are homeless people sleeping under bridges. Interesting. Met Debbie who was looking for a hike in the canyon while her husband was off at the motorcycle races down in the valley. She said they took a campground manager job for a summer and did not think much of it. All too often I can relate to that. Anyway, at one point her job was phased out. As luck would have it Debbie came across an article on caretaking. She convinced Les to quite his job and they sold their house, bought a class A, and invested the rest of the money. They started taking various house-sitting and caretaking jobs. Eventually they sold their RV and now only take jobs where housing is provided. They travel in a pickup with 2 mountain bikes and a motorcycle in the back and pull a utility trailer. They have been doing this for 20 years! Impressive. I met a couple with a 17’ fiberglass trailer and they had spent a year traveling through the states racking up, if I remember right, nearly 35,000 miles. Some of you can probably imagine that someone would have to hold a gun to my head for me to do something like that. Unreal. Their trailer’s tongue was weighed down with 2 6-volt golf batteries (in addition to the 2 propane tanks) and there was a rack on the rear bumper with a 4’ storage box. Definitely in the ‘RVer’ mindset. Well, my last pair of hiking boots died. Took them up to the crest trail one day and set them out in a secluded spot with a nice view. Made a mistake with my new boots. I did not run my hand around inside the boot to feel for rough edges. There is a spot that gets to be quite irritating after a couple hours of hiking. Oh well, they are good hack-around boots. Did not think I’d be looking for boots again so soon. Sure have been piling on the miles. Most of the hikers stay on the herd path up to Deseret peak so I frequently have the other trails to myself, especially since I’m on them by 6:00. 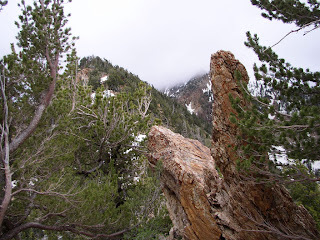 Probably my favorite loop is along the South Willow Lake trail to Pocket’s Fork and up to the crest trail. 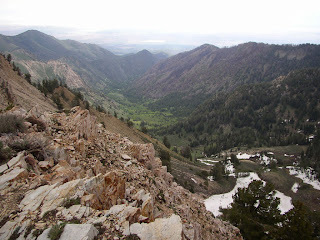 The view looking down into Big Creek Canyon with the early morning shadows is mighty fine. 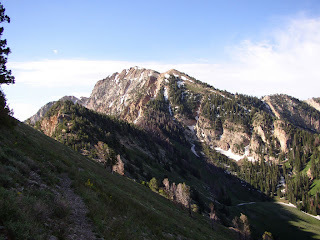 The crest trail south to Deseret peak has some beautiful scenery and most of it is in the shade if you are up to the Pocket’s Fork saddle by 8:30 or so. 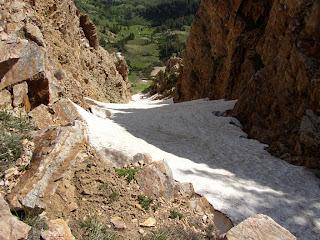 Then up and over the peak and down the herd path through Mill Fork to the Loop trailhead. 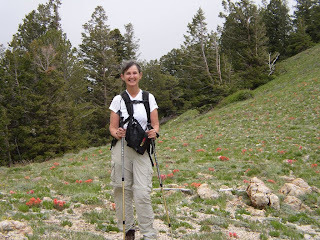 Hiking the loop counter-clockwise provides spectacular scenery with waterfalls, snow, aspen, pines, wildflowers, and the low morning sun casting shadows on the cliffs. Then late morning as one is hiking down, a good deal of it is in the shade of the trees in Mill Fork. A stellar 5-hour hike. ‘Deseret’ was the name proposed in the 1840s by Mormon settlers for what became Utah. A shot from the top of one of the chutes the backcountry skiers ski down. 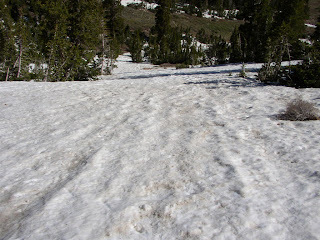 In early June it was WAY easy to get down the switch-backs—just slide down the snow. Cathy, who I met up here last summer, took me on a hike up West Canyon. Nice view from the top. 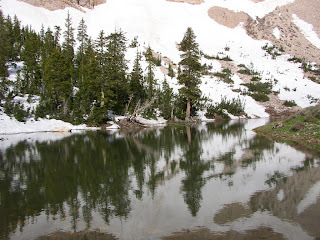 Up to South Willow Lake is another popular hike. 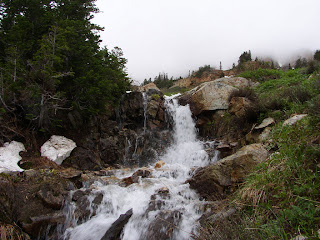 An early June hike through Dry Fork is fabulous with numerous waterfalls from the runoff. 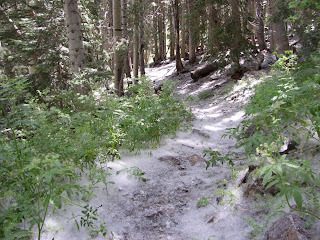 There was a week of so in lower Mill Fork where the ground was carpeted with fluff from all the cottonwoods. It looked much thicker than it does here in this shot. Last summer we had a forest fire. This year we had a mudslide. Most of the ground cover burned off on the steep slopes. 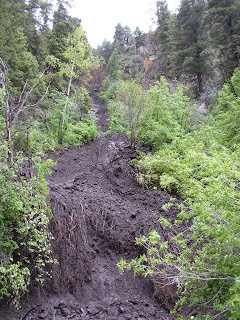 With all the rain we had for a few weeks, the soil became saturated and one night two truckloads of mud slid down a steep ravine. 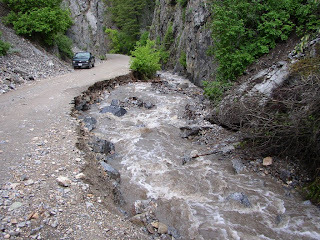 The stream was diverted against the road, ripped out 300’ of wire mesh and all the rock it was holding in place, and started taking big bites out of the road. I drove up the road the next morning, said uh oh, called down to the Salt Lake ranger district office and suggested they might want to get someone up here to take a look. 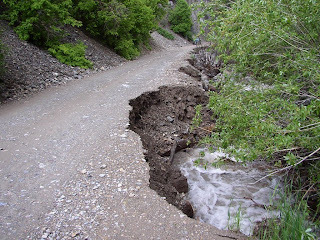 We closed the road to the 3 upper campgrounds. I had campers in 3 sites up there. I wasn’t too concerned about the tenters but I took some pictures of the road and took them up to show a young family in a class C. Thankfully they decided to move down to a lower campground. The road is still closed. Makes the Loop trailhead hikes an hour longer by the time one hikes up to the trailhead and back. The forest service re-evaluated the lower two campgrounds and let us open them so we have the lower three campgrounds open. A lot of grousing from the campers but I sure do like having to work only 20 hours a week rather than 40. Getting in a few good hikes each week. 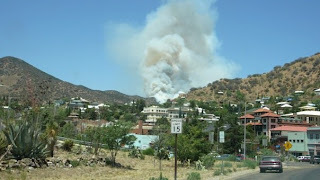 Lynn sent me this photo of the 122 acre Mule Tunnel fire they had on the west side of Bisbee this past spring. No people were hurt or any homes damaged. Well, one day we had a group who did not exactly blend in as campers. 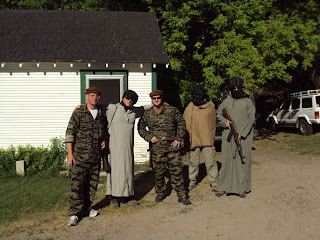 A group of Navy SEALS dressed up as Arabs along with half a dozen sailors held an exercise in the canyon. It caused quite a stir with some campers and hikers when they saw soldiers in camouflage and others dressed up in robes, all carrying automatic rifles. And, par for the course, no one had let me know in advance that this would be happening. Unreal. If one is looking for fiction by western authors, check out C.J. Box and Peter Bowen. Good reads with some pretty humorous lines. The July full moon is called the Full Buck Moon, when the new antlers of buck deer push out from their foreheads in coatings of velvety fur. It was also often called the Full Thunder Moon, thunderstorms being now most frequent. Sometimes also called the Full Hay Moon. money, people, stuff, and timefor things that matter. Voluntary simplicity is not about deprivation or sacrifice.